An easy way to add a delicious spicy kick to your pasta that isn’t too hot. Place the flour onto a pastry mat and create a well in the middle. Pour the hot sauce and water into the well and, using your fingers or a fork, mix together incorporating a little at a time until combined. Once combined knead the dough for about 10 minutes until smooth and elastic. The final step is to roll and cut the dough into whatever pasta you choose using a pasta machine. If you don't have a pasta machine you can still make the pasta by using a rolling pin to roll out a small portion of the dough at a time and then using a pizza cutter to cut the dough to the width you want. Be sure to roll the dough out so that it's nice and thin otherwise your pasta can end up too doughy. Notes... This pasta goes great with a creamy Alfredo-type sauce and chicken or simply mixed with olive oil and some vegetables for a lighter option. Either way it adds an amazing flavour to your pasta dish. If you have a Philips Pasta and Noodle Maker this recipe is even easier, you follow the normal steps outlined in the machine's instructions but instead of pouring in a mixture of water and egg you pour in the hot sauce and water. oh that is a cool idea, I will let my hubby know next time he makes pasta as he likes spice and hot! Looks and sounds simple – will have to give it a try. Love your pasta recipe,it look’s amazing! wow what a different recipe thank you very much for sharing this! A very interesting idea. I might have to give this a try. I’ve never heard of Frank’s Hot Sauce before but a quick google search and I note that Woolworths stocks it. I may have to buy some for my Dad Frank who is a chilli lover! I must try this; sounds amazing! Yum! Thanks for sharing! now this is a clever penne! 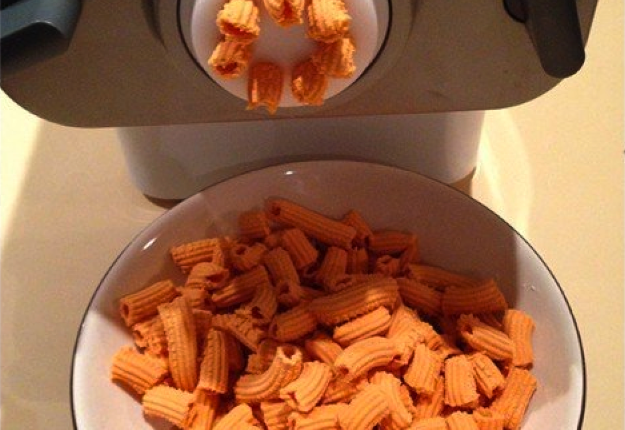 A super way to give your pasta some kick. Gosh I need to get me one of these machines! How awesome!